If you are using Teamleader as a CRM system, Vectera's latest feature will be of great value to you. The integration between Vectera & Teamleader will smoothen the flow of all your business. Integrate Teamleader with Vectera and save yourself valuable TIME! 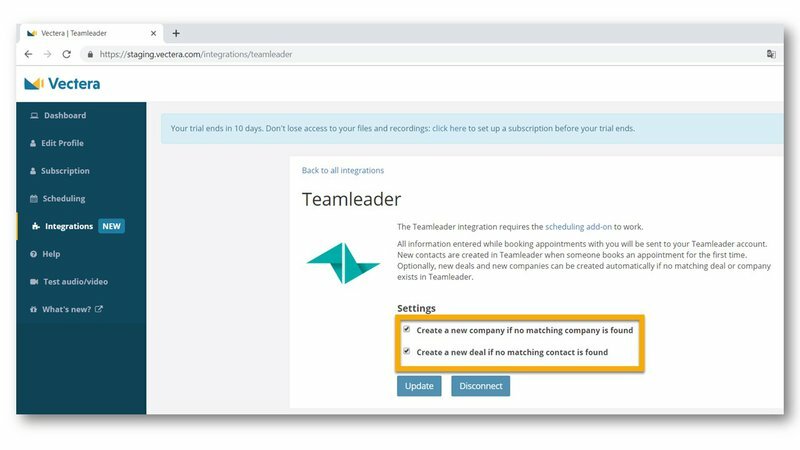 In general this is what you can expect: all new clients who schedule meetings in Vectera will be matched to your Teamleader contacts, if no match is found a new contact will be created in your trusted CRM system. Optionally, the same could be done for new companies and/or new deals. Let's have a look to how all of this works. First of all, you need to connect your Teamleader account with your Vectera account. This can be done very easily once you're logged on to Vectera. From your dashboard you can go to the "Integrations" tab. In this tab you will find all available integrations. Now, after you clicked on "Teamleader", you need to authenticate your Teamleader account by entering your login data in the window that pops up. Note: If you want to make use of the Teamleader integration, you need the scheduling add-on. After setting up the authentication, you will be referred to a setting page. All new guests that book a meeting on your personal booking page for the first time, but can't be matched to a contact in Teamleader, will result in a new contact on your Teamleader account. New contacts in Vectera, become new contacts in Teamleader. 1) "Create a new company if no matching company is found"
2) "Create a new deal if no matching contact is found". The first option is similar to the contacts, but related to the company name your client has specified. The second option goes even further and will create a new deal for every new contact. 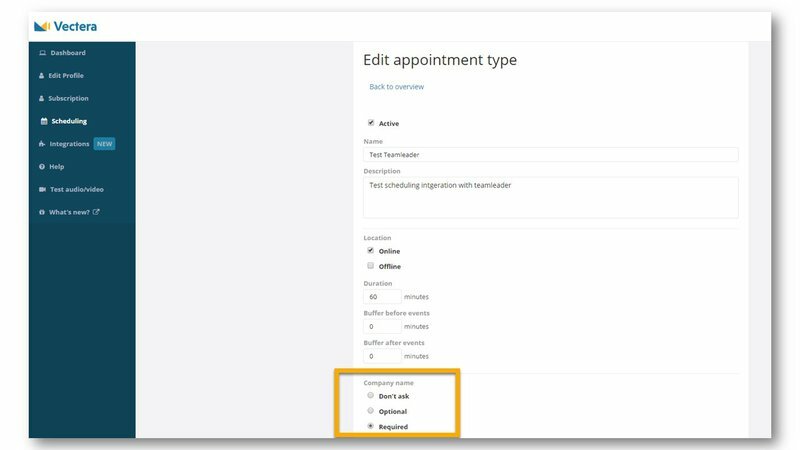 Note: If you chose to add the option "Create a new company if no matching company is found", you have to make sure that your appointment types are configured along. So, when you create or edit an appointment type, in the scheduling tab, you tick off "Required" or at least "Optional" for company name. If this is not adjusted, your guests won't be able to add a company name and therefore the system can't possibly match companies in Teamleader. What's next with the Teamleader integration? Integrating the scheduling part with Teamleader is a logical first step. A deeper integration with meeting rooms and documents (such as automatically filling meeting rooms with Teamleader documents) is next. Any suggestions on how we can make this work even better for you? Don't hesitate to reach out to partners@vectera.com. Keep following our blog to get updates on all the latest features of Vectera!